Face oils are probably the most divisive of all skincare products. If you love them, you really love them, and if you don't, well, you steer bloody well clear. I should just come out and admit that I'm a subscriber of the former camp, and I'll extoll the virtues of a facial oil to anyone and everyone who will listen. There's not an evening that goes by (beyond the ones where I hit the hay a little inebriated) that doesn't include the slathering of a rich, nourishing oil and a quick once over with a jade roller. Alongside vitamin C and a little AHA once in a while, I'm certain I have oil to thank for my fairly plump, hydrated skin. I do understand, though, that facial oils are scary stuff, especially if your skin is on the oilier side of things to start off with. So I'd like to show you a brilliant entry point to the category (whether you're a diehard oil user or not) and the oil I keep coming back to even when tempted by fancier, pricier versions. 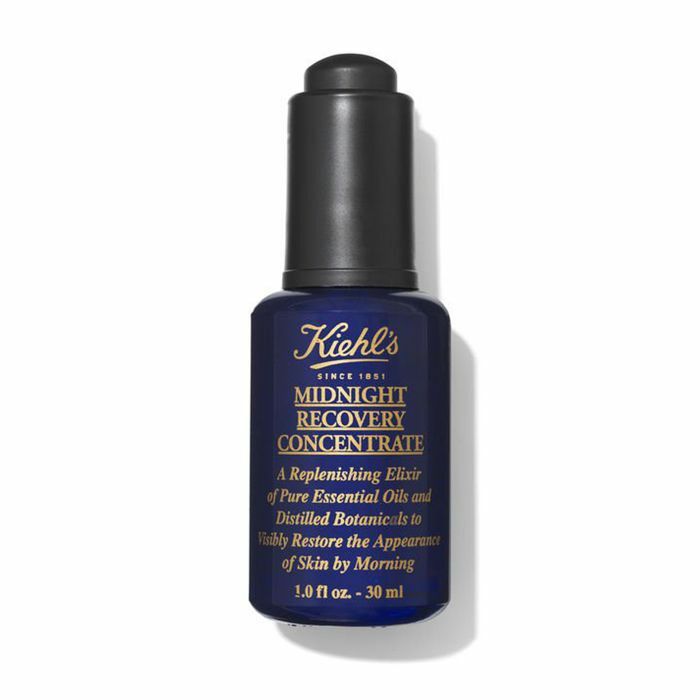 Consider this my ode to Kiehl's Midnight Recovery Concentrate (£38). Inside this little blue bottle lies a concoction of essential oils including lavender (the ultimate sleep inducer—just see these pillow sprays for proof) and evening primrose oil. There's also squalene, a skincare stalwart known for its ability to boost moisture, which in turn, leads to brighter skin. It also contains omega-6 fatty acids, which are great for giving skin that plump bounce. Of course, the idea that an oil can profess to be non-greasy is absurd—greasiness is oiliness and oils are, by nature, oily. But this one does have a drier sort of finish to it, which you can feel as you rub a little between your fingers. There's a gentle friction at play, which you know means it won't slip and slide over skin, but should sit nicely in place until it's time to sink in. Still convinced it'll wreak havoc with your overenthusiastic sebum glands? 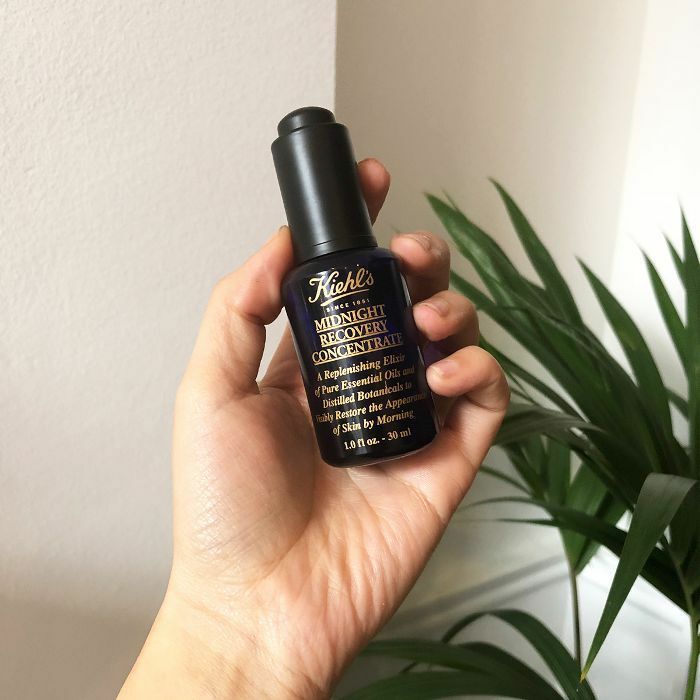 It's counterintuitive, but applying oil actually tricks skin into thinking that it's already made enough of its own, so in time, it's believed oil can train your skin to be less oily—go figure. You apply it at night (hence "midnight" being in the name) to take advantage of the fact that at night our skin enters recovery mode. Weirdly, our skin's barrier decreases in density at night, which means these ingredients have a better chance at reaching its lower layers and making a real difference. And make a difference it does. I always turn to it when my skin is looking whacked-out, and my skin drinks it up before I've even had the chance to put my book down and turn the light off. It's so reliable I know that after a few days of using the oil my skin will be back to its perky self. And it's that kind of dependability we could all do with.